SKU: M4-ENHF-3XFE. Categories: Antioxidant, Detox Support, Energy Boost, Extracts, Immune Support, Liver, Longevity, Men's Health, Skin & Hair Support, Women's Health. Tags: acne, alcohol, alcoholism, allergies, antioxidant, chronic inflammation, cirrhosis, cleansing, cold, detox, digestive health, fatty liver disease, flu, heavy metals, hepatitis, hormonal balance, immune boost, immune health, immune system, Kidney Health, Kidney Support, liver damage, Liver Diseases, liver function, liver health, liver support, nutrient absorption, skin problems, toxins. LVR-Renew has changed my life! I need to tell and thank you how LVR-Renew has changed my life! I’ve suffered from non-alcoholic fatty liver disease for many years. I’ve been taking the product for a couple of months. I went for my yearly physical last month. My doctor said that my liver function tests are finally down and within normal results. I said, great! Then thought, wait a minute, I’ve been taking this new supplement, and told him about LVR-Renew! I am truly so thankful for this product, I really feel its changed my health. I no longer have stomach discomfort and its also stopped me from taking other supplements that obviously weren’t helping the way your product does. Also stopped taking the statin prescribed by my physician. We highly suspect you have saved this boys life. This product is just amazing!!! It works to help you detoxify your liver and live healthy. The quality paid the benefits!!! I give 4 stars because of the minty suttle flavor it has, I can’t really appreciate. But I’m happy to drink it in my latte every morning! Ever think about the liver? Not too many of us do. Whether we do or not, this incredibly important organ is at the root of most everything our body does. Acting a lot more like a large gland (which it technically is), it creates needed hormones for healthy function, regulates blood sugars, bolsters immunity, and helps us combat sickness. And—best of all—it is our body’s ultimate detoxifier. When we slip up on diet, good lifestyle habits, and making enough time in our busy schedules for much-needed self-care, the liver’s job gets all the harder. But here’s the good news: when we do fall off-track with liver care, certain herbs can help us stay the course. 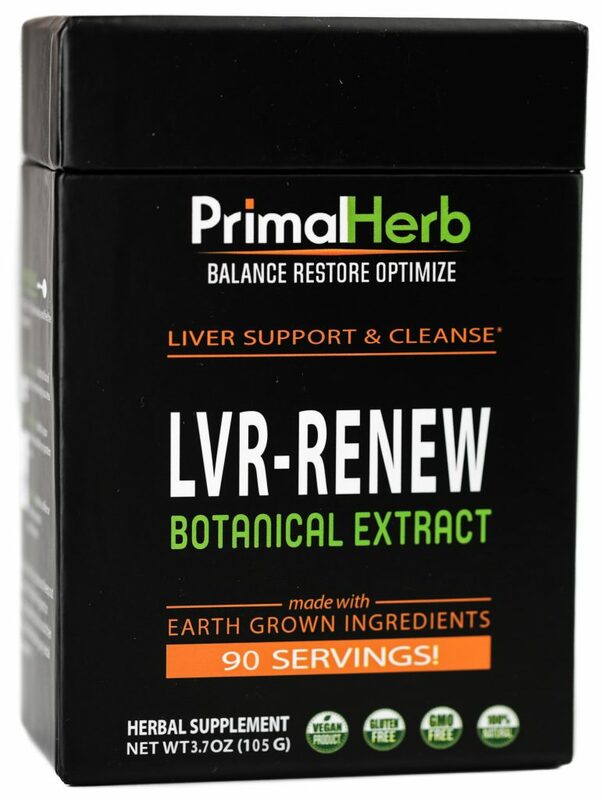 And we’ve happened to choose the very best evidence- and research-supported liver herbs for optimal health in our LVR-RENEW blend. WHY FOCUS ON LIVER HEALTH? For one single organ, it’s a lot of work pumping out all those impurities. And that’s not the only job the liver has to keep our bodies healthy: a big part of the liver’s job is making sure that we basically stay alive. Right up there with the heart, lungs, and kidneys, we need a liver to survive. It’s a vital organ after all. But if we also just want to be baseline healthy, we need to take the very best care of it, too. Without a strong, happy liver, lots of health issues may crop up. For one, we’ll have difficulty digesting food and getting nutrients we need to be well. Not only that, but the bad things our bodies need to get rid of will only stay stuck. While quite troublesome, these issues are things we can pay attention to and stay ahead of. We can change our lifestyles, improve our diet, and drop the use of liver-harming substances to improve liver health. But if we drop the ball for too long and too hard, it can lead to bigger problems further down the road. The liver is a powerful organ—it can take quite a lot. Whether it’s too many drinks with friends the previous evening, skimping on healthy foods for a day or two, or meeting that deadline by skipping a few meals, our livers—if they’re in a healthy state—will have it all covered. Worse, there are quite a few major diseases connected to bad liver health that can even be caused by this problem if we’re not careful. Some of the most common liver ailments are cirrhosis, hepatitis, fatty liver, and even liver failure. All may typically be caused and preceded by poor liver health as a warning sign. Fortunately for most of us, it takes a LOT for the body to reach this point, and to even develop liver diseases and issues. And even if it does happen, fixing up diet, dropping substances, and even exercising more can get anybody back on track. But if getting back on track just isn’t happening fast enough, liver-powering botanicals can certainly help! Herbs that help detoxify, strengthen, and heal the liver have been around for quite some time. In ancient traditional folk medicines, some of these plants were often called “blood cleansers.” They were thought to help filter and clean impurities from the body and blood stream, in effect helping the liver to do its job. Science has found that, in some ways, this folk medicine idea is not too far off when it comes to some classic cleansing herbs. So after a deep look into the research and reputation of many botanicals, we’ve chosen the very best to pack a healthy punch for the liver, and included them as a powerful lineup in our LVR-RENEW formula. There are many healing fungi around the world, though none may be as beautiful or eye-catching as the turkey tail mushroom. Dr. Axe on his website sings praises of its benefits, which include immune-boosting capabilities, anti-viral potential, and more. With health benefits comparable to notable mushrooms like chaga or cordyceps, what makes this mushroom in particular the most astounding is that it is quite common: you’ll find it growing on trees just about anywhere! To think that a liver-strengthening medicine grows only feet away during a hike through the woods is nothing short of miraculous. What more, recent studies on the mushroom have begun to peel away the mystery of how it helps the liver. A 2010 study found turkey tail killing tumor cells in the liver. Later, in a 2011 and 2012 study respectively, polysaccharides extracted from the fungus were observed protecting the liver from the negative effects of cancer radiation. With liver protection like this, the worst wellness issues can be healed and held at bay: including fatigue, digestive issues, skin problems, and more. 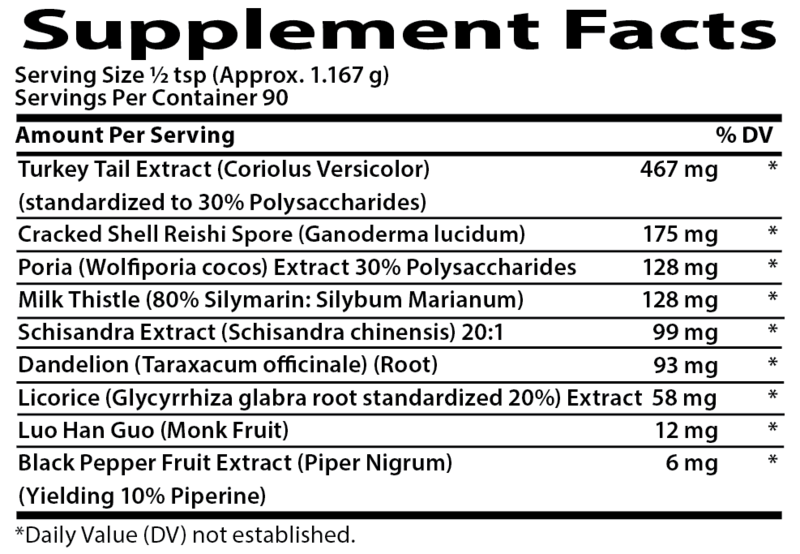 The reputable reishi mushroom is perhaps best known for its ability to boost immunity. Since ancient times, it was hailed as a heal-all tonic that cured all kinds of ailments. Apparently, part of its immune-boosting capabilities may be rooted in some liver protection potential. Tons of studies have been undertaken exploring this, establishing a very real connection between reishi and the liver. For example: a 2012 study found that extract from the famed mushroom could protect, treat, AND potentially reverse a fatty liver. Research in 2013 saw that reishi quickly healed and protected against liver damage, as did a study in 2014 showing that reishi rapidly sped the healing processes of wounded livers. With reishi working together with our other star mushroom in our LVR-RENEW blend (turkey tail), liver health will be stay at its finest. Liver healing is not exclusive to the world of medicinal mushrooms. Milk thistle, a common yet unassuming plant, may in truth have much of the entire fungal world beat! The seeds of the spiny plant (a distant relative to lettuce) contain compounds called silymarins, which are very formidable antioxidants. They are in fact so antioxidant and protective against free radical damage, that in a 2010 study, milk thistle was found to be competitive with a mainstream pharmaceutical for helping reduce the chances of liver damage. A review in 2015 went on to connect all the liver research on milk thistle, in conclusion calling it liver protective, regenerative, antioxidant, anti-inflammatory, and much more. Because this herb is almost synonymous with liver health in both the world of research and traditional herbal practices, we absolutely couldn’t exclude it from the line-up of liver healers in our LVR-RENEW formula. The poria mushroom does not have as much claim to fame as certain other mushrooms, like maitake or lion’s mane, for example. But, very much like its fellow fungi, it has been a favorite go-to for improving health in Traditional Chinese Medicine (TCM). This round, coconut-like mushroom was actually a mainstay in TCM for helping strengthening the liver with success, and is still used so in the practice today. On the other hand, research connecting liver benefits to poria is still quite young, with no solid studies yet established. Regardless, studies like this one in 2013 are establishing it as very valuable with its antioxidant, anti-inflammatory, anti-tumor, anti-diabetic, and even anti-depressant capabilities that no doubt have some benefits to the liver, even if yet to be proven. All the same, poria may very well be a medicinal mushroom that will soon blow up just as successfully as others have in the rest of the world, beyond just China. 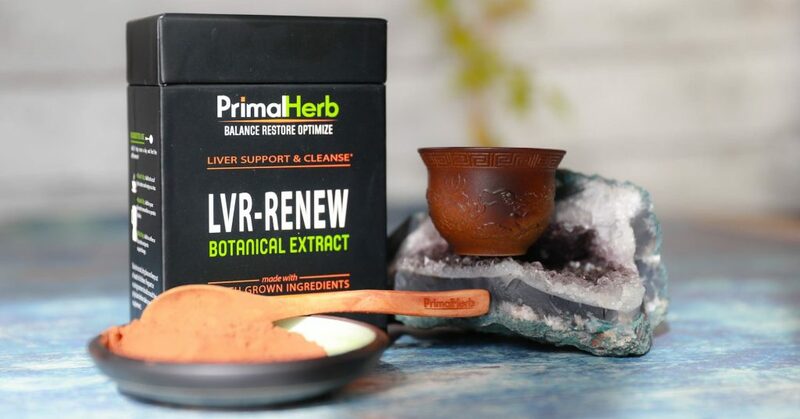 We ourselves have been so impressed by the evidence-based liver wonders poria has performed, which is why we couldn’t resist adding it to LVR-RENEW. This adaptogenic berry herb—better known for boosting immunity, raising energy, and regulating mood—may also have its own liver benefits to add to the shuffle. Alongside medicinal mushrooms and the famous liver-healing milk thistle, schisandra can easily be elevated to the same status with the research already established. In fact, research (especially very recent research) is quite plentiful in its explorations: such as in this 2010 study, where the berry was observed speeding liver recovery after a liver transplant, as well as acceptance of the transplant overall! Not to mention, a 2013 trial found that schisandra’s antioxidant qualities were enough to help protect the liver from damage. With our inclusion of schisandra in LVR-RENEW, we don’t only add even more liver-healing properties—we also add the five-flavored berry’s innate immune, stress, and energy restoring qualities as well. Most people would see a dandelion and immediately think about how much they want to yank it out of their yard or garden. But if these same people also knew just as much about its amazing health properties, they would most likely reconsider that action! In dandelion’s homeland in Europe, the yellow flower was the true liver “blood cleanser:” a detoxifying tonic and bitter digestive stimulant to help get a sluggish liver moving forward again. Now, with how much research and studies have been undertaken on this unassuming weed, it would seem that dandelion is capable of this and so much more. A 2013 trial found that dandelion leaf extract (an admittedly less phytochemically active part than the root) alone helped both help reduce the chances of and treat fatty liver. That same year, another study took it a step farther to show that dandelion helped restore function and heal damage in livers with cirrhosis. Don’t like dandelions when they grow in the garden? 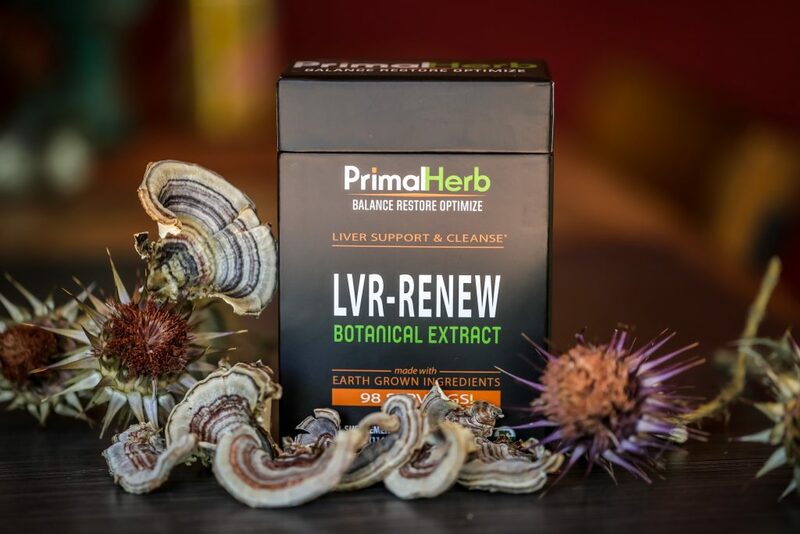 They might be much more appreciated in LVR-RENEW as one of our favorite liver-healing herbs, and our chosen blood cleanser and detoxifier in the formula. Last but not least: licorice is a popular favorite among all kinds of herbalists from all over the world. However, it’s more associated with its immune powers that fight colds, coughs, flus, and viruses—not to mention the root’s abilities of balancing thyroid and restoring energy. But helping the liver? This sweet root related to beans and peas it not so well-known for that, though recent research may change this soon enough. A study in 2011 already has shown that it protects the liver as an antioxidant in marine subjects. Next year in 2012, a study showed that mammals experienced liver healing and protection when taking licorice. Adding licorice to our herbal supplement formula ensures that, while working with our other liver tonic herbs, liver health in anyone will be kept in tip-top shape at a phytonutrient level. Do all these herbs on their own sound amazing? Think of how much more amazing they would be if they joined forces in one powerful supplement—which they just so happen to do in our LVR-RENEW supplement powder. At Primal Herb, each herb is carefully hand-picked to handle some element of liver health, no matter the state of health it may be in. Our herbs are not proven to cure liver ailments and disorders, to be clear. But they are proven by science and research to be a helpful herbal boost to make changing one’s lifestyle, dropping the liver-damaging substances, and improving diet all the more effective and successful. LVR-RENEW can be taken day or night – with or without food, so enjoy!